Pass & Seymour Single-Style Specification-grade 2-Pole 3-Wire Heavy-duty straight blade receptacle in black color, has voltage rating of 125-Volt AC and current rating of 20-Amps. It accommodates conductor of size 14-10-AWG. Strap mountable receptacle features nylon construction for longer durability. It has dimension of 1.32-Inch x 1.093-Inch x 3.68-Inch. 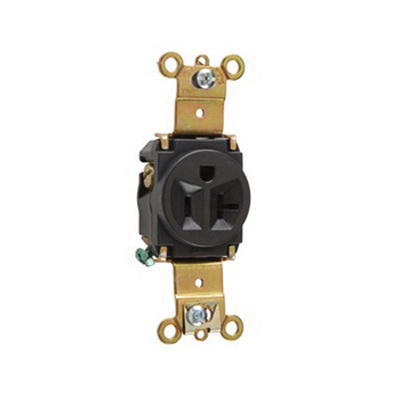 The NEMA 5-20R receptacle with automatic grounding, offers back and side wired terminal connections. Plated steel strap offers extra safety while plugging or unplugging. Brass contact ensures better electrical conductivity. Receptacle is UL listed, CSA certified, RoHS compliant and meets Federal specification.